This Saturday was the culmination of the Pink Singers’ 30th birthday celebrations: the ‘Hand in Hand’ festival and concert at The Troxy in Limehouse. As a new Pinkie, this was the day I was to ‘pop my concert cherry’ and – despite the 6am alarm bell, the 90-minute trek into the wilds of East London and the fear of being in the same room as 500 bananas (don’t ask) – I was beyond excited! 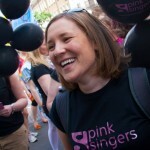 The five months since I auditioned for the Pink Singers has flown by, yet we have achieved so much. I am so honoured to be part of such a talented, creative, intelligent, loyal and passionate group of people. People who have created an incredibly powerful exhibition; people with the vision to commission Richard Thomas to compose music for them; people who have welcomed choirs large and small from around the British Isles to come and share a stage with them; people who can sing and dance so amazingly well it takes one’s breath away. At times this season I have felt a bit of a fraud, sneaking in on all this wonderfulness halfway through. However, standing in the foyer of The Troxy on Saturday morning ready to buddy one of the visiting choirs, I wore my Pinkies’ t-shirt with pride and truly felt like I belonged. There was such a buzz of excitement as the doors were opened and the crowds flooded in. Over 400 participants, dressed in all colours of the rainbow (what else? ), were here to sing and celebrate with us – how amazing! The vocal workshops were both fun and informative. 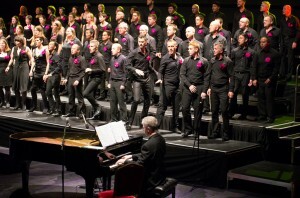 They took us on a journey from opera to medieval music, via world music and ‘belting’! 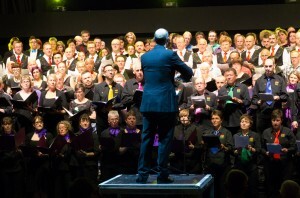 All 500 of us joined in with gusto and it was a great way for us to bond with our new friends from the other choirs. By the time the concert was due to begin, I was pacing up and down the corridor practising my very small, but seemingly epic, introduction speech for the Deep C Divas. When I’d exclaimed a week or so beforehand that I was from Leeds I didn’t realise it would mean stepping into a spotlight and addressing the crowd. Our first song, ‘I, Choir’ went down a storm. It was the first part of our three-part commission by Thomas, and as it was a world première, we had no idea what the reaction to it would be! The laughs and applause told us all we needed to know. It was so special watching all the other choirs sing and dance, one of them for the first time ever. But, I couldn’t wait for the time for our set to arrive. The ‘tropical’ conditions inside the Troxy, owing to a good ol’ fashioned heatwave made our hands a little clammier than usual, but that was soon forgotten as we watched a series of stellar performances from all our fabulous guest choirs. All of a sudden it was time for our set, and we were up on stage. From the moment the first few notes of ‘Jericho’ sounded, the whole thing flew by in a flash. I got the giggles when the risers started squeaking in time to our choreography, I almost got all the moves right, and I smiled one of the biggest smiles of my life when the audience clapped and cheered our final number, ‘Earth, Wind and Choir’, joined in wonderful harmony by all 500 voices who joined us for the day.